While travelling through Arizona, carnival huckster Smiley Wells (James Dunn) makes the acquaintance of sweet small-town girl Lynn Martin (Joan Bennett). Upon learning that a gang of slick operators has swindled a huge sum of money from Lynn's mother, Smiley decides that money lost through larceny can be won back the same way. With the help of his fellow conmen Kingfish Miller (Herbert Mundin) and Morris Blitz (Sammy Cohen), our hero devises an elaborate "sting" to out-maneuver the crooks and recover Lynn's mom's dough. But it's essential to their scheme that Lynn can successfully pass herself off as a hard-boiled "street dame." 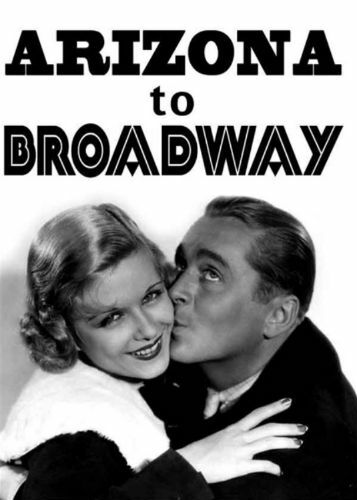 Arizona to Broadway was remade in 1943 as Jitterbugs, with Laurel and Hardy and Vivian Blaine.